One of Cornell’s two flowering-sized Titan arums — dubbed Wee Stinky for its putrid smell — is set to bloom for the fourth time. Rosemary Glos ’20 and greenhouse grower Paul Cooper measure Wee Stinky Dec. 7 at the Liberty Hyde Bailey Conservatory. Photo by Craig Cramer. One of Cornell’s two flowering-sized Titan arums — dubbed Wee Stinky for its putrid smell — is set to bloom for the fourth time. The big question is, will the plant give its macabre display of smells, heat and color before students pack up and head home for the holidays and campus closes for the winter break? Predicting precisely when the plant will bloom is complicated by cooler greenhouse temperatures and lower light intensities than what the tropical plant is adapted to in its native Sumatra, where it is threatened by habitat loss. As of Dec. 11, Wee Stinky stood 81 inches tall and was growing 2 to 3 inches daily. 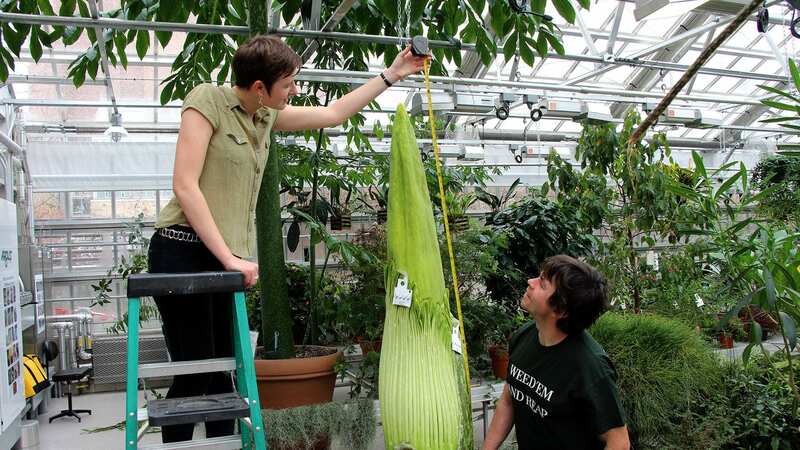 The plant reached 87 inches when it last bloomed in 2016. There is reason to suspect that it may grow taller this year: The underground corm — a structure similar to a flower bulb — that stores the plants’ energy increased in size considerably during the plant’s vegetative stage between flowerings. Carolus, the other Titan arum and Wee Stinky’s sibling, is currently in a vegetable stage, with its single leaf topping the rafters in the Conservatory. Cooper’s skill in coaxing these plants to flower every two years or so under the controlled conditions in the Conservatory presents the opportunity to study the flowering behavior of this remarkable plant, said Niklas. Titan arums typically start opening late in the day so that they are fully open and aromatic at night. During flowering, the plants reach internal temperatures of more than 100 degrees to create a chimney-like effect that wafts the pollinator-attracting stench far and wide. The shorter winter days may cause the blossom to start opening earlier in the afternoon and could cause the plant to burn itself out, shortening the already brief event that usually lasts just two days, said Niklas. The Conservatory is open to the public weekdays from 10 a.m. to 3 p.m. If the flowering happens before campus closes Dec. 21, hours will be extended into the evening to accommodate visitors. Otherwise, a stinkless flowering can be seen on a livestream available at the Conservatory’s website. You can also sign up for email updates to be notified when flowering commences. The Titan arum is not the only chance to see a rare flower in bloom. Angraecum sesquipedale (also known as Darwin’s orchid and Star of Bethlehem orchid) is also in flower at the Conservatory. When Charles Darwin first observed the flower in 1862, he predicted there must be a species of moth with a proboscis capable of extending deep into the flower’s foot-long spur petal to reach the nectar reserves at its tip. That moth, named Xanthopan morganii praedicta (or “predicted moth”), was discovered in 1903. The orchid and arums are just two of about 600 species from 144 different plant families and 347 genera on display in the Conservatory, which is the living collection of the Liberty Hyde Bailey Hortorium in the Plant Biology Section of the School of Integrative Plant Science. The Conservatory is maintained by the Cornell University Agricultural Experiment Station. Filed Under: In the news, What's happening?